You have been elected to be an anchor or host a special function, but you don’t have a script. Don’t worry here we will provide you the best script which will help you a lot to perform well and run the program phenomenally. 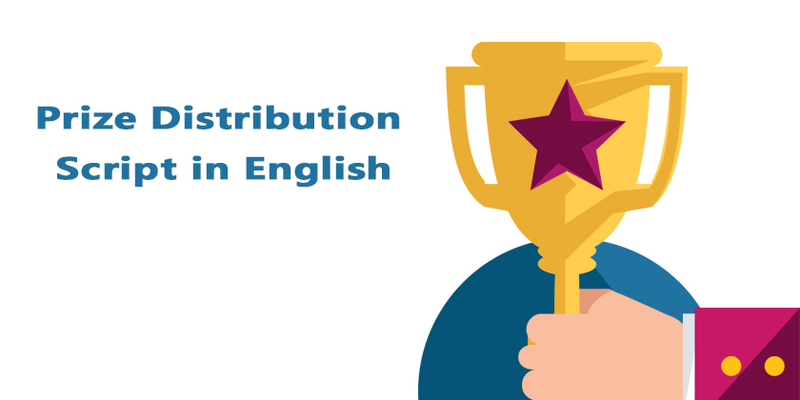 In this article, I cover prize distribution script in English, but before you I recommend you to visit the following pages to get some useful tricks and script for hosting or comparing. Click: Comparing Script to get more scripts. The prize distribution ceremony can be the especial occasion of a function. Indeed, this is the time when most of the competitors or position holders have been waiting for it. And being an anchor you need to announce the result in a proper way to appreciate and motivate the position holders. Below I have accomplished some lines for prize distribution script which could be used as an illustration. 1. Ladies and gentleman, this is the time we acknowledge the talent of our position holders, the position holders who have been struggling and facing many challenges and difficulties to be pioneers. In fact, that’s all because of their own perseverance, constancy and immovability that they are selected as champion. Ladies and gentleman to felicitate the prize of position holders I would like to call the great personality (insert the name here) to come on the stage to distribute the award of position holders, please give him a big hand. Now this the time to name the pioneer and the vanguard, the first position of our organization (insert the name here), please may I hear a thunder of claps for him or her to be present here on the stage and receive his/her appreciation award. 2. Now let me to announce another pioneer and talented person who has gotten second position. Any guesses, this has to be a guess. So, the second position goes to (insert the name here), please appreciate him/her to be present on the stage. 3. Now let’s come to the third position holders from the participants. Ladies and gentleman our participants are so talented who can be so versatile, they can do their job really well, and that’s proven right in front of you. Now I request you to put your hands together for our third position holder (insert the name here). I congratulate and appreciate the position holders and their parents who have put faith, hope, and love together and have raised a positive person in the society. Was the article helpful? In this article I covered some lines for prize distribution, to give your opinions please feel free to leave your feedback in the comment box below. We work as a team to provide the best and helpful articles for ESL learners. Please share Some experience about ceremony of certificate distribution… Thanks in Advance. Thank you so much Rose, hope it was the solution. Article was quite helpful, thanks. Thanks sir, i am a students,this article help me many ways. I was getting worried during annoual fuction and this fear has gone when i red your article..
How could we join you? Its was very helpful, thanks a ton. Excellent script n was very useful for me..
Hope it was beneficial Nadal Amjath. Thank you, hope it helped you. You are welcome Ketan. Hope it assisted you. I was choosen for anchoring. I was very worried before but now I am very happy. This article was very useful to me. I am glad it helped you Mawahib!